Broward County schools superintendent Robert Runcie is surrounded by members of the Marjory Stoneman Douglas High School Public Safety Commission. Robert Runcie, who leads the district's public schools, appeared apologetic and pledged to make policy changes informed by the commission's findings — although not as quickly as the members would like. Alternatively, Sheriff Scott Israel defended his agency's performance, placing blame for the slow and chaotic law enforcement response squarely on the disgraced former school resource officer who hid rather than entering the building while the shooting took place. The deputy, Scot Peterson — who was also scheduled to testify but skipped Thursday's meeting, defying a subpoena — reported to Israel before he resigned under pressure following the massacre. Runcie highlighted security improvements the district has made since the shooting and said he would continue that new focus going forward. "We are in our, kind of, 9/11 moment for public education. And we need to redefine what the education system looks like, what the priorities are," Runcie said. "And I will tell you that as far as safety, mental health — no question that those areas are as important, and may be more critical, than the academic piece. Because we'll never get to any of that unless we get those two pieces right." Questioned about Broward Sheriff's Office policies regarding the response to active assailant situations, Israel said his rulebook wasn't the problem. "Peterson could have had 10 policies. He could have trained for 10 years, and he would not have gone in," Israel said. "Peterson not going in was a performance issue. It had nothing to do with training and nothing to do with policy." The first question a commission member asked Runcie was to define "a sense of urgency." Runcie seemed taken aback. The implication was clear as other members followed up with questions about why changes hadn't yet been made to ensure students' safety. Runcie has said all schools in the district will be reconfigured so they have a "single point of entry," which is a system of gates and fences that directs visitors toward only one, secure entrance. But it's not clear when that work will be complete. "If he's going to change the culture, and he's going to make school safety and security a top priority, … he's going to have to know what's the status of getting these things done," said commission member Ryan Petty, who lost his daughter Alaina in the shooting. He recently ran for a county-wide seat on the school board and lost. Another parent and commission member, Max Schachter, argued some lives might have been saved if police had had access to live surveillance footage. On the day of the shooting, police hesitated moving up to the third floor — where 10 people had been shot — because delayed videos made it seem like the shooter was still there. Schachter, whose son Alex died that day, asked Runcie to make that change immediately. Runcie said he would do it soon. 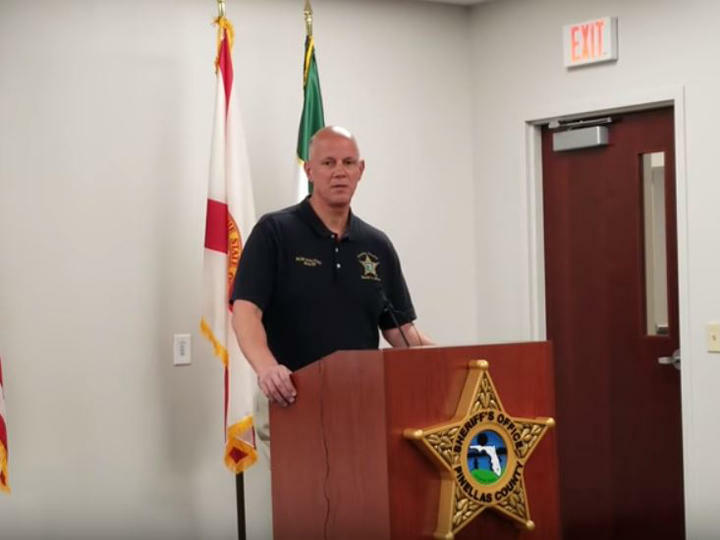 Schachter and the commission's chair, Pinellas County sheriff Bob Gualtieri, pressed Runcie to require that classrooms have what are called "hard corners." Those are places where students can hide and not be seen by someone looking through or shooting through a classroom door window. "The hard corners were not effective in the classrooms in building 12. And the facts are the facts: There's at least one student who died on the line," Gualtieri said, as Runcie agreed: "Yeah." "I'm going to ask you to create a policy — not a guidance, but a policy — that mandates that the schools under your direction have a hard corner, so that these kids can be safe," Gualtieri said. Runcie said the change couldn't take place overnight but that he could craft a new policy and bring it before the school board during its December meeting. "[Runcie] just needs to hold these people accountable," Schachter said, referring to school employees. "That's the only thing we've wanted for nine months, and it hasn't happened." State Sen. Lauren Book, a Broward County Democrat and the only lawmaker on the panel, took issue with the district's slowness in adopting new policies for code red drills. On Feb. 14, the shooter's gunfire triggered fire alarms, and the simultaneous fire alarm and code red drill caused confusion and chaos. "We're nine months and a day since the shooting," she said. "It's unacceptable." Israel was the last person to testify Thursday evening to the commission. Israel has been heavily criticized since the shooting — after his Broward Sheriff's Office deputies hid behind cars and trees, instead of going into where the shooting was taking place. BSO's active assailant policy states that deputies "may" enter an area to save lives — but they are not required to. Israel defended that policy. "I personally have the word 'may' inserted in the policy. The reason — and I wholeheartedly believe in that word — is because I want an effective tactical response, not a suicide response," Israel said. "May allows a deputy discretion. "Make no mistake about it: Our deputies will go in and insert themselves into harm's way," Israel said, "just not in a suicidal manner." Petty, the parent and commission member, echoed recommendations from other sheriffs on the commission to change the wording of the policy. Multiple suggestions for Israel to replace the word "may" in his policy with "shall" were met with claps and cheers from the crowd in the packed ballroom. Israel said he did not come before commissioners just to answer questions. He also had a request: that the commission push for one fully-regional 911 system in every county in Florida in the report members will deliver to the Legislature by the end of the year. Broward County has a regional 911 system, but Coral Springs has its own separate system, as does Plantation. "We need 67 regional communication systems," he said, meaning one for each county. Commissioners have said in past meetings that they will look into whether all cities in Broward can come to an agreement and join the regional system. A Marjory Stoneman Douglas High School administrator who predicted Nikolas Cruz might become a school shooter — and joked with others that the troubled student might target him specifically — is among the latest people to face consequences for missteps in handling the Feb. 14 shooting there. Stoneman Douglas Assistant Principal Jeff Morford and three other staff members will be reassigned, Broward County Public Schools announced Monday.